Well, the bad news is, the pirate town isn't done yet... The good news is that it is well on its way! It is fully built, at least the main part! I am now finishing up on the painting and waiting for my palm trees, etc. 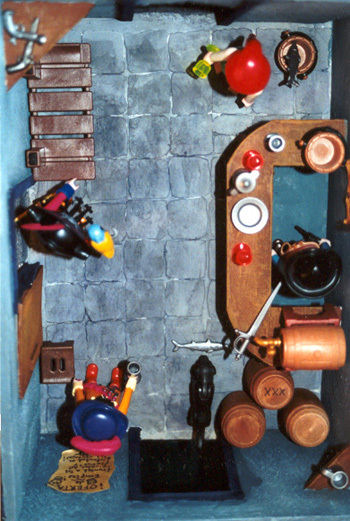 to arrive from Playmobil mail order... I'm shooting to have it all wrapped up by the end of October! 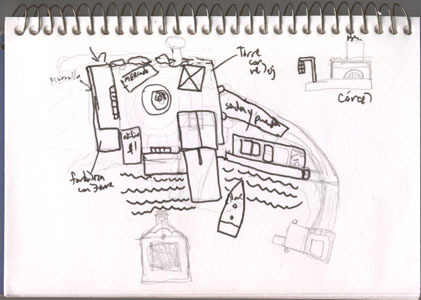 I've enclosed a rough sketch from my notepad that shows the basic lay out... Kind of hard to decipher. 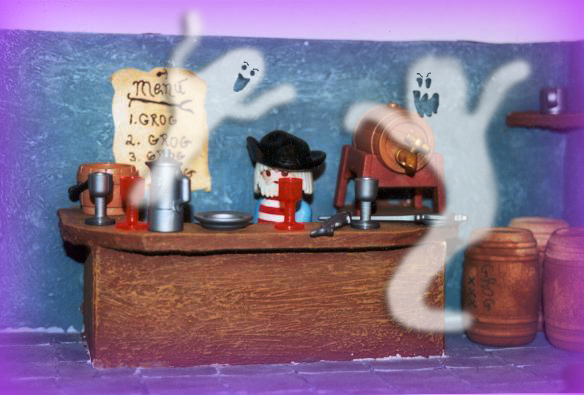 Also am sending a couple of pictures of the Tavern to get people in the Halloween mood... You'll see what I mean! The other features on your page have been great! 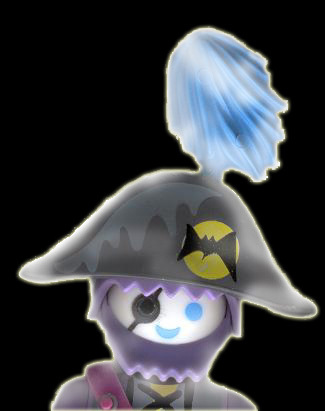 I'm really looking forward to the pirate photo stories! Take care and keep up the great page! 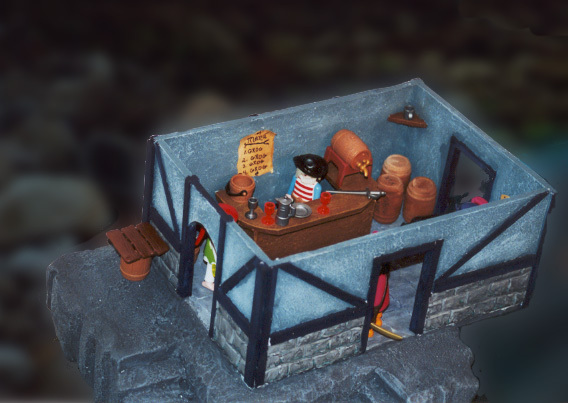 Thank you for your interest in the tavern... It was a really fun project to work on! Before building, I tried to make some fairly accurate plans on paper. I managed to follow these pretty closely, but of course had to make some modifications based on the materials I used. The base of the model is a couple of pieces of styro foam used for packaging electronics, which I glued together with hot glue. The walls of the building, and the roof (yes, there is one!) are made out of foam board. I covered the walls with spackle and made the dark blue framing beams out of light balsa wood strips to give it a Tudor look. The brick foundation along the bottom of the outside walls is also made with spackle. There are three pieces: the base and the bar wall and back wall are connected. The front wall and other side wall are connected and can be lifted off. 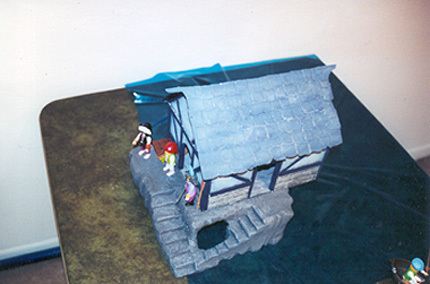 Of course, the roof is also removable. I tried to make it as accesible for hands as possible. I made the base look like rocks and cut the steps in it by using sand paper, kind of messy. I painted it with acrylic paints. I suppose you can use this method to make just about any type of building for any era! I also made a couple of Spanish style buildings, and in fact had plans to do an entire pirate town, complete with docks and a Spanish style fort to guard the bay. Unfortunately, I haven't had the time or inspiration to complete it. 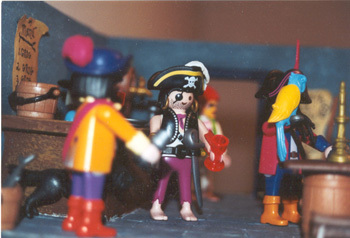 My Playmobil collection is mainly pirate-centric. 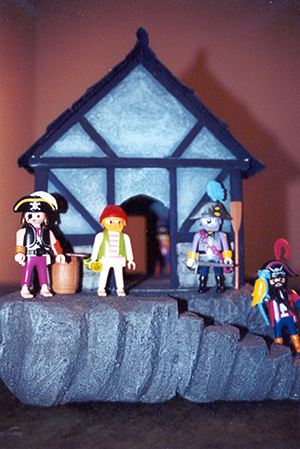 I do have some safari sets, some eskimo sets, and some of the very old western sets, but the pirate sets were always my favorite. I have the older version of the ship and a lot of the smaller sets. I also like the castle sets but only have a couple of the minor ones. I really like what you have done with your site, as you have shown how versatile the toy can be for creating characters from varying periods of history. I live in Lombard, IL. 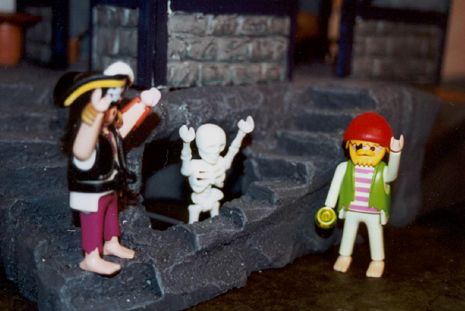 It is a suburb of Chicago,an area where there is a multitude of smaller toy shops selling Playmobil. 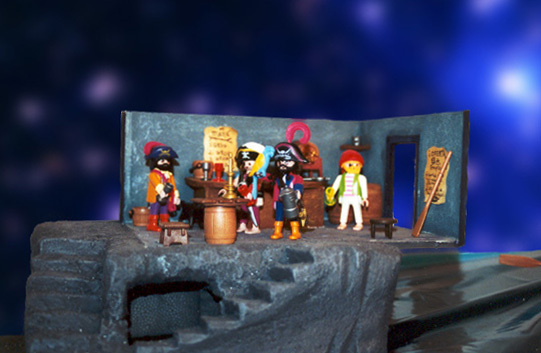 I'm really looking forward to seeing your finished pirate site!